SPANGLER GMBH in Töging focused their calculability in a customer event – with a guest lecture of the mathematician and poker coach Stephan Kalhamer from Regensburg with the title “Profound decision making under uncertainty”. An audience of 55 guests from politics and business experienced astonishing parallels. The intellectual leap from the poker game to enterprising action and to potential similarities does not succeed at the first go. A sentence of the referent is thought-provoking all the more: The poker game teaches us to analyse risk neutral, to be brave, to make profound decisions and to think ahead actively. These words do not accidentally sound like a statement from a textbook for risk management as the decision maker have to deal with people they do not know in the poker game as well as in the everyday business. Or else they are exposed to non-fictional constellations which they cannot appreciate accurately against the background of their experiences. During the lecture, it has become all too clear that decisions are neither concerned with luck nor with accident in both cases but should exclusively be the result of an accurate analysis. 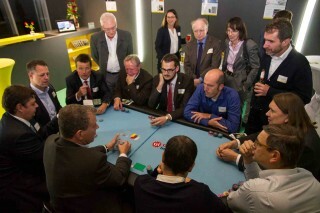 Thus, Stephan Kalhamer does not impart poker skills primarily but the methods which lead to success both in game and in everyday life – and led CEO Hannelore Spangler to invite him to a lecture in the end: “We wanted to present our guests a different view of profound decision making under uncertainty and impart the systematics of a whole new field of operation in a playful way.” In both cases, the assessment of people, the conception of their motives and the careful weighing of chances and risks are the focus of our activities – all against the backdrop of the highest possible successful and (in case of a company even) long-term cooperative trade. Among the event guests, there was a mixture of astonishment, thoughtfulness and respect for the playful performance of Mr Kalhamer at the end, especially as most of the guests were at the poker table to put theory into praxis after the lecture. Poker player are gamblers, businessmen, coolly calculating facts freaks. These are the common opinions on these job profiles which are very contrary at first sight. 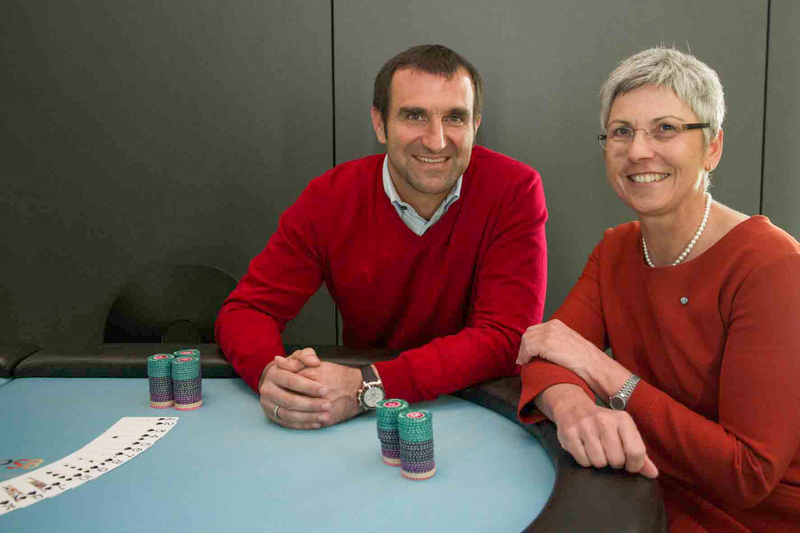 A discussion between Hannelore Spangler, CEO of SPANGLER GMBH and poker coach Stephan Kalhamer from Regensburg unearths the facts on both sides. 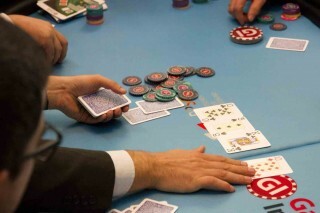 Playing poker in order to win orders is a popular saying. Was this the reason, Mrs Spangler, to invite Mr Kalhamer to a lecture? Spangler: No, because this behaviour is very one-sided in everyday life. For us, the most important thing for the invitation was to give our guests with the lecture of Mr Kalhamer a different view on partly similar situations because during contract negotiations there are many unknowns and uncertainties as in a poker game. Therefore, similarities in the decision-making processes are obvious. Poker players are daring figures who sit in the smoky backroom of a shady dive bar and shift big sums of money across the table. What does reality look like Mr Kalhamer? Kalhamer: Hollywood made a good job concerning this matter and I also got to know the poker game similarly at the beginning. The pictures produced in western and gangster movies persist in people’s minds even though today’s reality looks completely different. The modern poker professional plays by day and online, practices his apprehension and combination skills in countless simulations. As in other sports, regular practice and an exact preparation for big games are the key to success in this game too. And one more thing is part of the coarse reality: to win in humility and loose with dignity. Winning is not to be taken for granted and in case of a defeat you have to be able to forgive yourself, otherwise you will resign. You are a studied mathematician. What does the queen of natural sciences have in common with the game of poker? Kalhamer: Analysis, combinatorics and stochastics, thus strict mathematical procedures form the basis for profound decisions in the game of poker. Therefore, they requested me independently to take action both as ambassador for the game of poker and as ambassador for mathematics. This science is my passion and on the basis of my experiences I see imparting the enthusiasm for knowledge and science as my task. As even the decisions in daily life are based on calculation, siting and an aim. These abstract coherences must be conveyed vividly so that they fascinate. Nothing should be left to chance in business planning whereas luck plays a role in the game. Are both systems so contrary in reality, too? Spangler: Of course, all deliberations will be questioned in detail and planned exactly but one thing should never be ignored in everyday business: the small quantum of luck which you also call fortune and need for successful decisions. While there are only winners and losers in the game we try to achieve mutual solutions and in this manner create trust at all levels. The analysis of the opponent matters in negotiations to fathom his motives for possible decisions. Kalhamer: A profound decision has got something to do with luck only in the margins. In the game I need to know how my opponent ticks to use this knowledge in my favour. Good players fight at eye level and with an open visor. I have to find a balance between luck and skill, between courage and humility to keep the necessary distance in case of a wrong decision. A risk should always be calculable. What do decision processes look like if this is not the case? Spangler: I always have to try to bring light in the darkness. Without a profound fundus of facts you cannot make a safe decision neither pro nor contra. In doubt, the afore-said quantum of luck comes into play. Kalhamer: In this case the courage to take risks is not helpful but again only the prosaic analysis: There is one situation before and one situation afterwards, there is a difference between both. If I am not able to calculate this difference for me sufficiently, I have to back out. The courage to take risks is only the very last option in a situation where there is high uncertainty. Looking over the fence broadens our horizon. 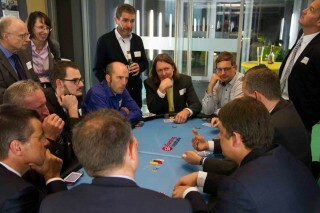 Which findings can managers gain from the principles of a poker game? Spangler: The most important thing is to keep calm and to keep the overview in a negotiating situation. Furthermore, it is necessary to be well-prepared, to keep always an eye on the counterpart and to exercise healthy tactical manoeuvring. Kalhamer: The only thing I can add is that knowledge is more valuable than trading. 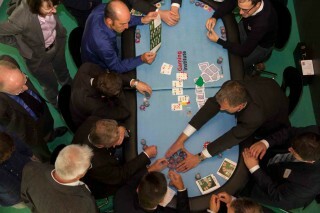 Stephan Kalhamer obtained his diploma in mathematics at the University of Regensburg and became familiar with the poker game Texas Hold’em during one academic year in the USA. In 2006, he founded the Gaming Institute and since then he attends to the topics training and consulting. Among other things, Stephan Kalhamer was manager of the German European champion team EPC Wiener Neustadt and the German world champion team IFP Nations Cup. In addition, he advises the International Poker association IFP, he takes an active part as appraiser at questions concerning gambling and he worked as a poker commentator for the telestation Sport 1. In regular lectures Stephan Kalhamer shares his knowledge to companies, associations and schools. SPANGLER Automation employs around 130 people at its headquarters in Töging in the Altmühl valley and has been a reliable partner of the national and international mechanical and plant engineering for more than 35 years. More than half of the plants produced are exported worldwide. The medium-sized family-run company plans and engineers plant automation, programs the control technology and manufactures switch and control systems for various sectors such as environmental technology, agricultural economy, building industry, food industry, automobile industry, raw materials industry and pharmaceutical industry. 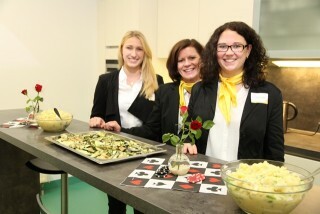 Moreover, SPANGLER carries out the start-up as well as the after-sales service of the plants.